It can take only seconds for conflict to escalate. In running down a list of potential causes of conflicts or altercations, the impacts of dementia are often not included. In the summer of 2017, Paula Span, of the New York Times Old Age Blog, produced an impactful piece, "Another Possible Indignity of Age: Arrest," which detailed occurrences where someone living with dementia was forcefully and violently responded to, in some cases resulting in serious injury or death of that person. Such was the case when an older man in California with dementia was shot and killed after mistakenly being seen as someone defying police orders and having a gun, which later was found to be a crucifix (as cited in The New York Times by Span, 2017). While this can certainly be a challenging circumstance to navigate, the results of this incident, and others which Span reported on, illustrate how important necessary information about dementia is—not only for community stakeholders such as the police but for all members of a community. Awareness about dementia and its symptoms has been found to be low (Tan, Hong, Luo, Lo, & Yap, 2012). Tan et al. (2012) reported in their research that close to 60% of their study participants incorrectly defined dementia, and 48% considered dementia to be a normal part of aging. While trainings that include education regarding mental health are available for a variety of professionals, it is becoming increasingly important for this information to be available to entire communities. Providing access to communities as a whole can be important not only for persons living with dementia but their caregivers as well. A variety of organizations are committed to hosting more discussions about dementia in community spaces. However, historical barriers that prevent discussions on general mental health such as depression can also be found wedged between conversations about dementia. Generally it may be difficult to admit that something may be wrong or changing within us. One may take pride in their independence and capability of managing their own matters. Receiving a dementia diagnosis can be challenging to accept no matter the point of view. Like in other types of chronic illness or disease, individuals may resist this diagnosis in order to denounce labels such as dependent, sick, broken, or incapable. While there has been a significant shift in research and focus on person-centered care and its effectiveness within this work, dementia was not always as adequately understood. This is true of many mental and physical health challenges, and unfortunately can still contribute to misperceptions today. In some cases, when a person may be initially diagnosed with dementia or a memory impairment, quick conclusions, such as no longer being able to drive and needing nursing home care, can be drawn. For some, these types of interventions are necessary in order to provide support, safety, and quality of life. For others, this is related to common misperceptions about dementia. Dementia can cause changes in memory, abilities to perform complex tasks, personality changes, and other symptoms. However, in accordance with the framework of person-centered care, it is crucially important to recognize each person living with dementia as a unique individual with unique changes. As no one person is the same, no one person living with any disease, health issue, or dementia-related illness is the same. Misperceptions about illnesses such as dementia can originate from fear. When we do not understand something, it can become more dramatized and concerning. When one is not aware, for example, of what dementia is and how a person can change as a result of its symptoms, individuals may be less likely to seek out education and resources. However, similar to how primary care offers blood pressure screenings, diabetes screenings, and cholesterol screenings, discussions about memory changes and memory screening tests are also necessary to truly explore one's entire health. 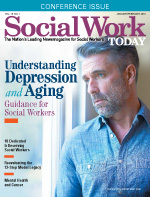 As a social worker working with the aging population, I speak with caregivers often regarding the isolation that dementia can cause not only for their loved ones but for themselves as well. One individual described to me how challenging it can be, at times, to have dinner in a restaurant, as the staff are not knowledgeable as to how to respond to a person who may be asking a question more than once, or perhaps is unsure in other ways. Changes in communication and other cognitive processing are unfortunately what may occur for someone living with dementia. What may result from an interaction like this is that both the individual and the caregiver may choose not to frequent public spaces and places any longer in efforts to protect themselves and avoid judgment. As a facilitator for caregiver support groups, judgment is something that comes up in conversation often. A caregiver may express feeling judged in that restaurant by the staff, by family members who are inquiring about the individual's state of health, or, most importantly, by themselves. Judgment, whether operationalized by one's self or by those around them, can contribute to breeding shame. As we can imagine, shame has the power to prevent a high quality of life. We should no longer be counting solely on individuals with personal connections to dementia to educate us. Information about dementia—and mental health in general—needs and deserves to be a part of any basic training for all disciplines and all workforces. In doing this, we can continue to chip away at the stigma, fear, and guilt that many infrastructures rest on. Fewer crises and better policies for individuals living with dementia and their caregivers could develop as a result of better educating society as a whole. My education and job orientation included significant amounts of information about dementia. However, it is unlikely that other workforce members will receive and have access to this level of information, as it may not be relevant to their occupations. It is also, perhaps, not made clear on a macro level why this information may matter to various community members in addition to health professionals. In any type of educational instruction, it is important to recognize the various ways individuals can learn. Some may prefer to hear and see information; others may be more receptive to self-study styles and reading. As each person is different in these respects, it is beneficial to be aware of a variety of different tools and resources. In addition to learning styles, health literacy is also important when conducting a needs assessment for educating the workforce about dementia. According to the National Academies of Sciences, Engineering and Medicine (2004), about one-half of all American adults have difficulty with understanding and accessing information on health. In order to ensure a basic level of understanding regarding dementia, educators must survey the needs of their audience and offer information that is accessible, concise, and informative. Education on dementia is valuable not only to health professionals but also to all members of a community. This increased attention and understanding has the power to effect change. The Alzheimer's Foundation of America (AFA) is committed to educating community stakeholders no matter their position on dementia-related illnesses. Through the national toll-free helpline, telephone-based caregiver support groups, National Memory Screening Programs, Monthly Care Connection webinars, and more, AFA provides time, education, and resources to anyone in need. Additionally, AFA's signature training program, AFA Partners in Care: Supporting Individuals Living with Dementia, also provides an opportunity for any professional to learn more about this illness. Other organizations with free and accessible information include the National Institute on Aging as well as any local Agency on Aging. As the aging population continues to grow, the incidence of dementia may also experience an increase. In efforts to support yourself and those around you, consider accessing resources to learn more about dementia and ways you can help educate others. National Academies of Sciences, Engineering and Medicine. (2004). Health literacy: A prescription to end confusion. Retrieved from http://www.nationalacademies.org/hmd/~/media/Files/Report%20Files/2004/Health-Literacy-A-Prescription-to-End-Confusion/healthliteracyfinal.pdf. Span, P. (2017, July 21) Another possible indignity of age: Arrest. The New York Times. Retrieved from https://www.nytimes.com/2017/07/21/health/older-americans-arrests.html. Tan, W. J., Hong, S. I., Luo, N., Lo, T. J., & Yap, P. (2012). The lay public's understanding and perception of dementia in a developed Asian nation. Dementia and geriatric cognitive disorders extra, 2(1), 433-444.